I try to write my blog posts objectively as possible but this collection, this artistic collaboration between cultural icons, blew my mind. Raf Simon’s collaboration with the Robert Mapplethorpe Foundation is one of the most stimulating collections I have seen in a long time. Obviously I am a great admirer of both artists, but this collaboration was more then Simons simply plastering Mapplethorpe’s controversial imagery on a t-shirt and banking on the raw sexual appeal of the garment. Raf paid proper homage to the artists hyper sexual, slightly minimalist inspired aesthetic. Models donned leather pants and overall inspired aprons with leash-like chokers hanging from their necks. The curly haired muses wore seductively tilted leather biker caps, each capturing the full essence of the legendary photographer. 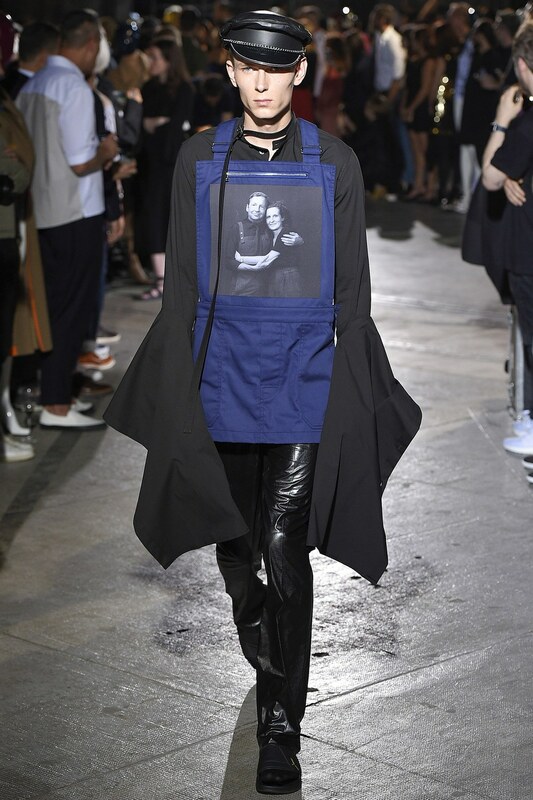 Oversized sweaters and shirts with carefully placed panels projecting classic Mapplethorpe images and slender slacks ran through most of the collection. Black socks paired with slide sandals lent a contemporary urban appeal and sleeveless cropped varsity sweaters playfully emphasized the collections preppy-deviant allure. Although there wasn’t a vast difference between looks each was so highly concentrated and carefully styled that I loved all of them. I know my words did not do the collection any justice but I was so overcome with excitement that it was literally hard for me to concentrate!